There is much to love about Crescent Shores 1812, a North Myrtle Beach vacation rental with a tremendous oceanfront view. 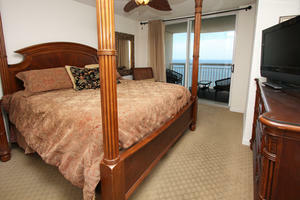 It is a spacious North Myrtle Beach penthouse condominium. 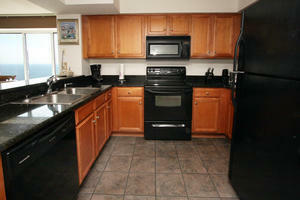 With four bedrooms and three baths, this vacation rental is quite large. 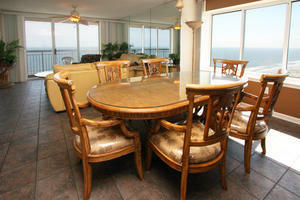 Crescent Shores 1812 is a lovely penthouse condo rental in a high-rise tower. 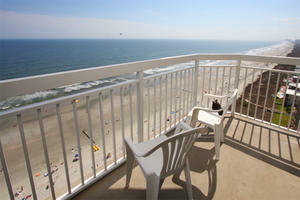 How would you like to look out at the Atlantic Ocean from the 18th floor of an oceanfront resort every day of your North Myrtle Beach vacation? The living room has floor-to-ceiling windows so you have a view straight outside from your seat on the plush furniture. You can see the sky and the ocean without any trouble at all. A wall of mirrors in this oceanfront condo in North Myrtle Beach, South Carolina allows the sunlight to bounce all around the room and keep the kitchen, dining area and living room lit up with natural light. Crescent Shores 1812 is an end condo and a penthouse, so the number of windows featured in this North Myrtle Beach vacation rental is astounding. Take a leisurely soak in the Jacuzzi tub at Crescent Shores 1812. 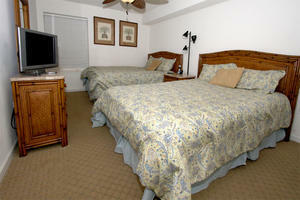 Get online with the WIFI access that is provided in this North Myrtle Beach vacation rental. You can even do laundry in the comfort and privacy of this North Myrtle Beach rental because a washer/dryer are provided for you. 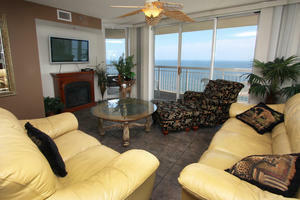 You will find televisions and DVD players in this corner penthouse North Myrtle Beach condominium. On site at Crescent Shores is an indoor swimming pool, as well as an oceanfront pool deck with a swimming pool, lazy river, hot tubs and kiddie pool. There is covered parking and a fitness center on site, too. 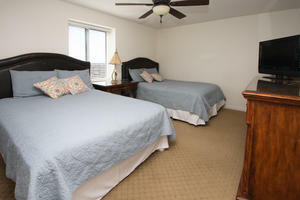 Shopping, dining, Myrtle Beach golf and live entertainment theatres are only minutes away from this oceanfront North Myrtle Beach vacation rental in the Crescent Beach section of North Myrtle Beach, South Carolina.